To start, I would like to introduce myself. My name is Rich Nichols, and I am going to be a senior at Iowa State University in the fall. I am majoring in Animal Science and minoring in Agronomy. I was raised on an 80 acre hobby farm in Southwest, IA. Growing up, my main agricultural experience was with show cattle, as my family has a 25 head herd of shorthorn and club calf cows on our acreage. I was actively involved in 4-H and FFA, and developed a deeper passion for livestock and agriculture because of those programs. I also worked for a local farmer all through high school, and through that experience, I was exposed to the row crop side of agriculture as well, but it was mainly just an “introduction”. My agronomic interests had been sparked. Therefore, as I started college in the fall of 2010, I knew that Animal Science was a great fit with my agricultural interests, but that interest in row crop lingered, and I decided to declare an Agronomy minor. The classes were interesting, and grew my interest in the subject. However, despite all the information I was presented, and material I was asked to learn, I still didn’t understand agronomy in the way that some of my classmates did; the classmates that grew up farming corn and soybeans on their family’s farms, the classmates that had experience. I realized what I had been lacking: agronomic experiences. 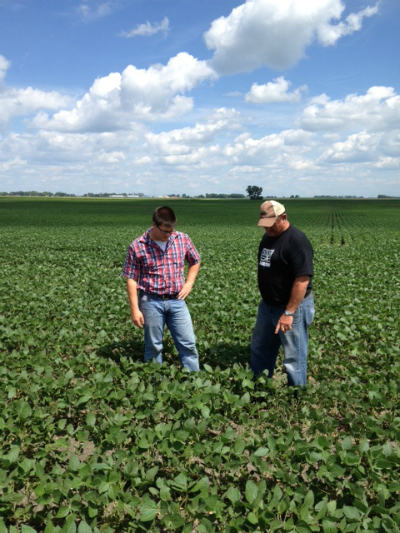 So, I determined that at some point in my college career, I wanted to spend time interning with an agronomic company. I got that experience this summer, namely a four week stint in Olivia, MN observing and working for Corn Capital Innovations. I had no idea what my expectations should be when I showed up the first day, but it was quickly made clear that I was going to be treated extremely well and exposed to many agronomic practices. To put it mildly, I was pumped. During my first week, I was exposed mainly to Net Effective Plant Stands (NEPS). I helped and observed a fellow intern, Reed Nelson, with this. The idea is to identify the number of standards plants, delayed plants, planter skips, or double planted seeds out of 1/1000th of an acre. In addition, we did some “digging”, both literally and figuratively, to diagnose delayed plants. Common issues in emergence were hard pan and smeared sidewalls, in which tillage creates compaction and limits root establishment and growth. We also noticed that seeding depth and residue were interfering factors as well. To finish up, we would take stand counts to determine an accurate estimate of the number of plants per acre. During my second week at CCI, I spent time shadowing Steve Oneill, who is the founder and owner. The week started off with a bang, as he explained to me the intricacies of crop insurance. I had never been exposed to much on this topic, therefore it was a very educational experience and I now understand the huge upside of crop insurance. I now feel like I could explain the basics of crop insurance to people and also see it to be a necessary expense for any profit minded and progressive farmer. Another experience during week two was customer interaction via field walkthroughs and agronomic observations made and discussed with the growers. I had the opportunity to identify weeds, take more stand counts, look at root systems, observe a custom planting dispute and eventual resolution, as well as look through a soybean seed packaging facility. Week three was just as educational as the previous, as I spent most of my time with Scott Oneill, Steve’s brother and field agronomist for CCI. Just as in the week previous, I was learning right away, as I was exposed to tillage practice differences and their effect on the rooting system in corn. Fields that had been field cultivated had a noticeable layer of compaction four to five inches deep into the topsoil that had retarded both tap root, and hair root growth. To no surprise, the corn in these fields was not as healthy as would be deemed optimum. In contrast, in fields that had been vertically tilled, the tap roots and hair roots were not restricted by compaction and were allowed to flourish underground. The amount of hair roots present in the soil between the rows was substantially higher than in field cultivated fields, while the hair roots present on tap roots were more extensive. The result of these extensive root differences were noticeable above ground as well, as these plants generally had a deeper green color, had a more uniform stand, and exhibited less nitrogen deficiency burn on the lower leaves. Through the rest of that week, I continued observing these tillage differences as I pulled nitrate samples in numerous fields with Scott to determine the amount of available nitrogen left in the soil, which would give us a better understanding of what the plant’s possible needs would be through the rest of the summer, which happen to be when peak nitrogen uptake is occurring (pollination-black layer). During my final week at CCI, the main bulk of my time out in the field was on Tuesday and Wednesday. Tuesday I spent time with Scott and was exposed to sugar beets for the first time as we took some stand counts. Additionally, we walked through bean fields looking for cut-offs and bruising (the result of hail damage) with insurance adjustors. I learned how to identify a cut-off bean plant, and by the end of the day, was fairly proficient in doing so. Wednesday I was with Steve all day. I rode around with him and observed customer interaction and discussion regarding pollination and its intricacies, future fungicide application, and possible Nitrogen application pending the results of soil samples taken the week prior. As a whole, I am beyond grateful and fortunate for my time I was able to spend interning at Corn Capital Innovations. I have learned more in the past 4 weeks than in all of the agronomy classes I have taken at Iowa State, and now feel more adept to understand and relate to the information that I will be presented in the classroom. The big points I have taken out of my time here this summer are 1) the role that crop insurance plays in farming along with its importance, and 2) the noticeable differences between corn stands, health, vigor, root depth, nutrient uptake, etc. due to tillage differences, namely vertical tillage vs. field cultivators. I want to conclude by thanking the whole Corn Capital team for their professionalism, kindness, and hospitality they have shown me this past month. I have been treated like a regular member of this team, and am beyond grateful for that. I now have a deep respect for all the CCI employees, and view this company as a top tier organization that truly cares about all its customers. I have no doubt that their business will continue to be successful because of the way that they treat people and the values of integrity they hold on to. Corn Capital Innovations, I wish you the best of luck in the future, and hope our paths cross again.